It is a measure aimed at saving up to 1,000 lives a year. The bill for setting it up is £57m and it could land you with a £1,000 fine if you fall foul of the new rules. Yet many of those affected claim they know nothing about it. Welcome to London's Low Emission Zone (LEZ). From 4 February, most of Greater London will be ringed by 75 camera sites, automatically checking hundreds of thousands of registration numbers entering the city's Low Emission Zone (LEZ). The zone is an attempt by the mayor to improve London's air quality, which is the worst in the United Kingdom and among the poorest in Europe. Transport for London (TfL) has said there are an estimated 1,000 premature deaths and a further 1,000 hospital admissions annually, due to poor air quality. It is said about half of all air pollution in London comes from transport and mayor Ken Livingstone hopes the LEZ will reduce emissions overall by 16% by 2012. The LEZ does not affect cars or motorcycles but targets old lorries, vans and other ageing diesel-engine vehicles which TfL claims are the worst polluters. It also hits emergency vehicles such as ambulances and fire engines. The scheme initially requires vehicles of more than 12 tonnes to meet Euro 3 emission standards for particulate matter - basically tiny pieces of solid "dirt" coming from the exhaust - in order to operate freely within the area. 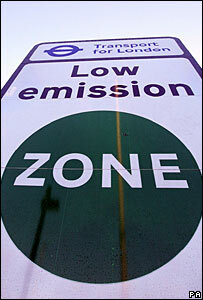 Those not meeting the emission standards will have to register with TfL and pay up to £200 a day to enter the zone. Those which are unregistered and caught on camera entering or driving around the zone could be fined up to £1,000. Similar schemes have been running in Japan, Sweden, Germany and Italy. Londoners deserve clean air but we don't think this scheme will deliver that. Most organisations support the scheme's target of improving air quality but critics say the LEZ has been rushed in, is too expensive and will not deliver many benefits. TfL estimates the set-up cost of the scheme is £57m and the annual operating costs are £10.7m. There will be 75 camera sites and 10 mobile units to enforce the zone. Geoff Dossiter, from the Freight Transport Association (FTA), said: "Londoners deserve clean air but we don't think this scheme will deliver that. "We don't think the LEZ will achieve anything that will not be achieved with the progress of cleaner engines anyway." The FTA said about 50,000 vehicles are used to deliver goods and services to businesses and consumers in Greater London. 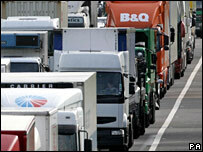 But it estimates about 10,000 vehicles may not be compliant. John Milicevic, who runs the Smith Metal Centres company which stores and delivers metal, said he has spent about £41,000 in buying or making his vehicles compliant to LEZ standards. He said there are a number of options available for making vehicles compliant but he has gone for the Eminox filter option - which costs between £3,500 and £5,000 depending on the type of vehicle. "I am in favour of what the LEZ is trying to achieve - we all need clean air," he said. "But there has been very little publicity about this. I have been working on this since 2004 but a lot of operators are still unaware of it." His feelings are echoed by the Federation of Small Businesses which said many of its members did not know about the scheme. TfL has dismissed the criticism, saying it had run two periods of consultation and carried out a publicity campaign. But the LEZ has also been criticised for penalising vehicles such as ambulances. Ellaine Young, from the St John Ambulance, said becoming complaint with the LEZ will cost the charity more than £1m. "This obviously is having a significant impact on our budget, it is a large chunk of it," she said. Nick Fairholme, Head of the LEZ, said most of the vehicles operated by community and voluntary organisations will not be affected by the LEZ until late 2010, giving them more than three years to plan for the zone. He added: "Despite significant improvements in recent years, London's air pollution is the worst of any city in the UK and among the worst in Europe. "The LEZ aims to reduce traffic pollution by deterring the most individually polluting diesel-engine lorries, buses, coaches, minibuses and large vans from driving within our city. "Reduced pollution from these vehicles will improve the health and quality of life of people who live in, work in and visit London, especially those suffering from respiratory or cardiovascular illnesses that restrict their daily activities."